We celebrated Orthodox Easter this past weekend and had such a lovely holiday. 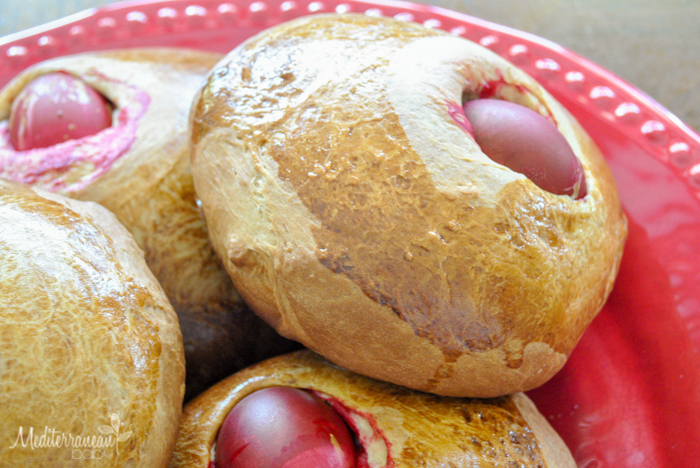 One of our traditions is preparing sweet Easter bread, complete with a red egg in the center of each loaf. That being said, this bread recipe can be enjoyed all year round, sans the red egg. We also make this bread for New Years with a hidden coin for good luck somewhere in the center. If you have a stand mixer, you’ll never need to purchase bread for your holiday festivities again since the electric kneading takes all of the hard work out! Christos Anesti (Christ is Risen)…Alithos Anesti (Indeed He Is Risen)!!!! In a small pot, bring water, bay leaves, and cinnamon to a boil. Simmer for three minutes and set aside. When the water is no longer steaming hot, but well before it is cool, strain the water into a bowl and add 1/2 cup sugar to the water. Stir until the sugar is disolved and add yeast. Set aside and allow the yeast to bloom/activate. In your stand mixer, beat butter and remaining sugar. Add six eggs, one at a time while beating in between. Continue mixing and add orange juice and milk. Add yeast mixture. Begin to add flour, one cup at a time. Continue to add flour until the mixture transforms from a batter to a dough. The dough will be a bit sticky, but not too much. You want the sides of your mixing bowl to be clean. At this point, use your kneading attachement and let the machine knead the dough for 7 to 10 minutes. Sprinkle flour in a large bowl, form dough into a ball, and place into the bowl. 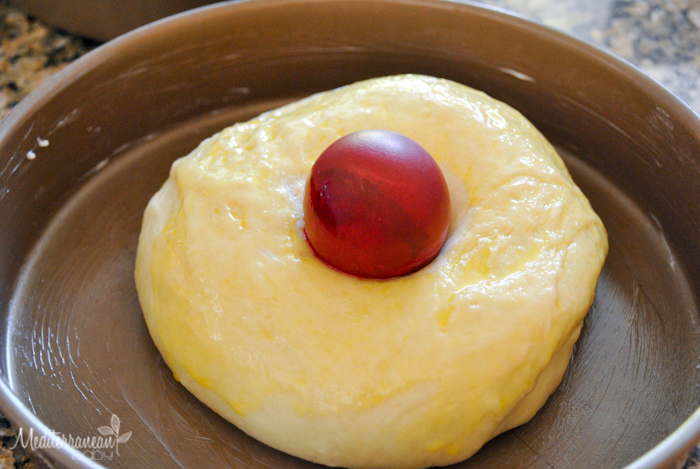 For Easter bread, be sure to sprinkle flour on the top of the dough ball in the shape of a cross. Cover with two kitchen towel and allow to rise in a warm place. In a few hours, the dough should double in size. Uncover and punch the dough down. 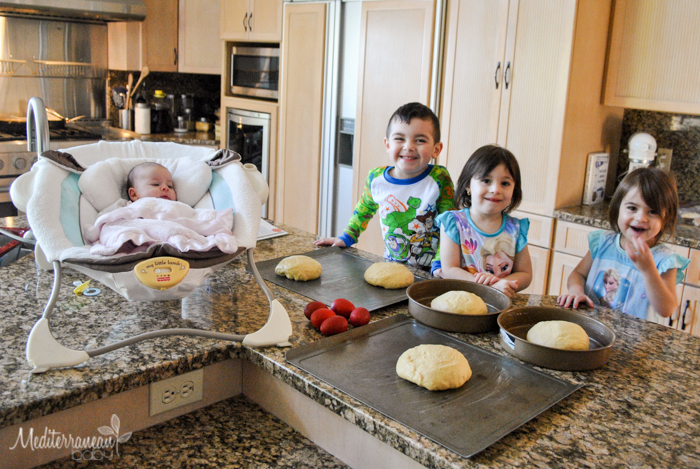 Form 7 to 8 loaves of bread and place in greased round pans or cookie sheets. Allow to rest for 15 minutes. 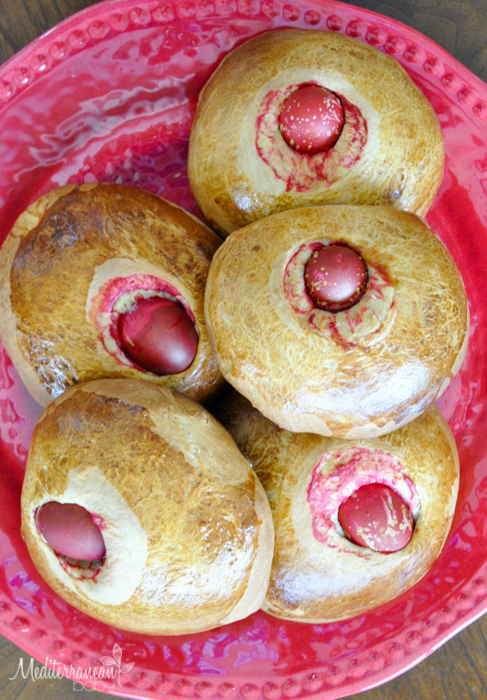 If making Easter bread, place a red hard boiled egg in the center. For New Years, insert a quarter wrapped in foil into the dough. Preheat the oven to 325. Beat the remaining egg and a splash of water and brush the tops of each loaf with egg wash.
Bake for 40-45 minutes until the bread is golden brown.